It’s been another busy month here in the Hollywood of the South, with plenty of new movies and television productions and the return of some old favorites Here’s a roundup of what we saw, where we saw it, and how to know which production you might have just spotted. New this month, Kevin Hart returns to Atlanta for his new film, Night School (production code: GED). (But no word as of yet if he’ll organize one of his impromptu 5Ks.) Night School will follow a group of troublemakers attending night school in order to pass a GED exam. Joining Hart will be Keith David and Tiffany Haddish. We first saw GED signs off of Briarcliff Road on September 13. The next day more were spotted on Ponce De Leon Avenue at Freedom Parkway. Crews filmed in Midtown on the 21st, and off Chattahoochee Avenue on the 22nd. Yesterday, scenes involving a Porsche were filmed near Atlantic Station on 17th Street. Coming off of his double Emmy win for Outstanding Lead Actor in a Comedy Series and Outstanding Directing for a Comedy Series, Donald Glover is back home for the long-awaited second season of Atlanta (MiniM). Crews set up shop in Mechanicsville between September 20 and 22. Also on the 22nd, filming took place at an office building in East Point. On September 25, signs were spotted leading to Southlake Mall. And, of course, it wouldn’t be a filming update without at least one Marvel film shooting in our city. Ant-Man and the Wasp (ML), starring Paul Rudd, Evangeline Lilly, Michael Douglas, Laurence Fishburne, and Michelle Pfeiffer, started out September at Clark Atlanta University. On September 9, signs dotted Ted Turner Driver near Martin Luther King Jr. Drive. Most recently, Ant-Man has been downtown, working on top of Underground Atlanta and in Centennial Olympic Park. Signs have been spotted as far away as the newly christened Georgia State Stadium. Another new film this month is Netflix’s Nappily Ever After (NEA). Based on the novel by Trisha R. Thomas, Nappily Ever After is a romantic comedy about a woman who leaves her live-in boyfriend after he just won’t commit. The usual independence and self-discovery follow. The film stars Sanna Lathan, Ernie Hudson, and Ricky Whittle (who you might recognize as Shadow Moon from Starz’s American Gods.) The movie started production at the tail end of August, shooting on Deering Road, near Amtrak’s Peachtree Station. The next day, a basecamp was spotted at Peachtree Presbyterian Church on Roswell Road. Signs were spotted between August 30 and 31 at North Avenue and Piedmont Road, leading to a basecamp in northern Midtown. On September 7, crews worked out of the Porsche Experience Center. On the 14th, filming took place in East Point. Most recently, on September 20, a basecamp was set up at 11th and Juniper Streets in Midtown. 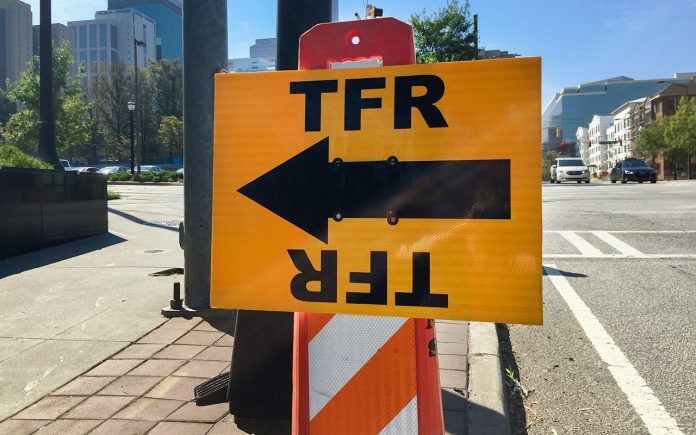 Last week production began on The Front Runner (TFR), a film about former Colorado Senator Gary Hart and his ill-fated 1988 presidential campaign. While this movie is in town, you could run into Hugh Jackman, Vera Farmiga, Kaitlyn Dever, Sara Paxton, J.K. Simmons, Molly Ephraim, Mike Judge, and Toby Huss. We first saw filming take place downtown, on September 19, near the Marriott Marquis. Signs were spotted the next day on Ralph McGill Boulevard. More were plopped on Ponce De Leon Avenue and Peachtree Street on the 21st. The day after that, production moved out to Tucker. Since then, shooting has been taking place in Covington. We’ve stolen a new television series! MTV’s Scream (SS3), which shot its first two seasons in Louisiana, is now calling the Peach State its home (and tax haven). And accompanying the change in scenery, the series will also have a new cast including Teen Wolf star Tyler Posey and rapper Tyga. For the most part, Scream has been working out of Douglasville this week. On September 21, however, we did spot SS3 signs in Mechanicsville. Last month, we teased the start of Dumplin’ (DHI)’s production. The Jennifer Aniston film (based the the Julie Murphy novel) was busy in late August and September. Before September 9, production mostly stayed in Jonesboro. On September 15, a basecamp was set up at the First Christian Church of Atlanta on LaVista Road in Tucker. On the 16th, crews filmed in Marietta. They were back up there, working out of the Cobb County Civic Center, on September 23. FOX has a new series filming in Atlanta called The Resident (TR). Starring Matt Czuchry, Manish Dayal, Bruce Greenwood, and Emily VanCamp, the show is a medical drama about a resident’s early days practicing medicine. On both September 7 and September 17, we saw production in Conyers. On the 18th, filming took place at the Woodruff Arts Center. BET’s The Quad (GAMU) has returned to film its second season around Morehouse College. On September 14, 15, and 18, we saw signs pointing to the campus, which stands in for the fictional Georgia A&M University. The Uncle Drew (BUCKETS) commercial-turned-movie was also seen in Atlanta this month. Filming took place in Conyers on August 22. The 25th brought signs to the East-West Connector near Austell as well as at Paces Ferry Road and Cumberland Parkway. On September 14, crews shot downtown near the W Hotel. CBS’s MacGyver (EYE) continued to film its second season into September. On the 9th, Peachtree Station was the locale. Signs were placed off of Peters Street for Castleberry Hill shooting between the 13th and the 14th. Crews moved closer to Georgia State Stadium the next day. Between September 19 and 21, residential shoots were done in East Cobb. We last saw MacGyver downtown on September 23. And also this month, The CW’s Valor (VLR) set up shop at Oglethrope University on September 14. Step Up: High Water (SUP) signs were seen in Conyers on August 28. FOX’s The Gifted (HVN) shot near Atlantic Station on the 9th. Star (SOS) was on the Westside at the end of August. And finally this month, we’ve got a new trailer for The Walking Dead‘s upcoming eighth season. The sneak peak seemingly puts Maggie in a leadership role on par with Rick, which should be no surprise to readers of the comics. With the show now set squarely in the All Out War comic book arc, expect more fighting, action, and explosions galore. We also know that arc will conclude this season, so it’s safe to assume Georgia’s biggest show will have its biggest season yet trying to fit in one of the most celebrated stories of the comic series into just 16 episodes. Don’t miss the season premiere on October 22.